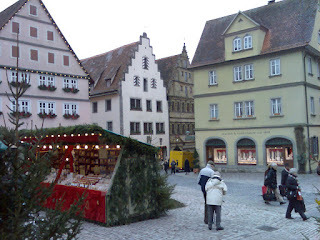 We're in Rothenburg ob der Tauber at the moment, and truely, it is quite magical. (Forgive me the odd typo - the keyboard is German and I don't have access to the control panel to change the input). It is certainly a little on the cold side and I am glad for all of the merino wool we stocked up on, but it's quite a delicious, crisp cold, rather than the damp, icky cold we get a home over winter. I honestly do not know how to do this place justice using mere words. Our hotel alone is like stepping back in time, and is just so magical. Its all dressed up in its christmas clothes, but so tastefully done. The window displays in all the shops along the street are fabulous, with fresh pine sprigs all around them, candles, Father Christmas' of all shapes and sizes, and mistletoe - which I'd previously only ever seen on TV or in photos! The bakeries are a feast for the eyes - all with their own various renditions of the Schneeballen (once you've had one you're unlikely to require another!). The delicatessans (or perhaps they have a different name) are fair bulging (pun slightly intended) with all manner of sausages and salamis and a variety of other things that I don't have a hope of identifying - but may just buy anyway so we can find out! We've been quite suprised, but equally delighted with the sight of people in restaurants with their dogs on the floor beside them - and I don't mean little Paris Hilton style dogs either, I mean alsatians, and others of similar size! Quite different! Our host here at the Goldener Hirsch is quite a delight all of his own! Simon thinks he's a bit like Basil Fawlty - and I don't disagree! He's quite wonderful and has an unexpectably effusive sense of humour. Ah so much to see and take in! I'm in my own private heaven surrounded by so much medieval history, buildings, monuments, roads, and on and on. Ooh, and with impeccable timing, a horse and carriage just rolled past the window. Hehe. Bliss. I could stay here forever. Or at least enjoy dreaming about it forever.